Welcome home a new baby with a stork sign rental for the front lawn! If a friend or family member is expecting or adopting a new baby or grandchild in Clear Lake or any surrounding areas, rent a stork lawn sign as a special gift to announce the new arrival. A stork sign will be a precious memory of those first few days at home with a newborn for years to come. New baby stork signs are the perfect way to announce a precious new baby, grandchild, niece, or nephew! 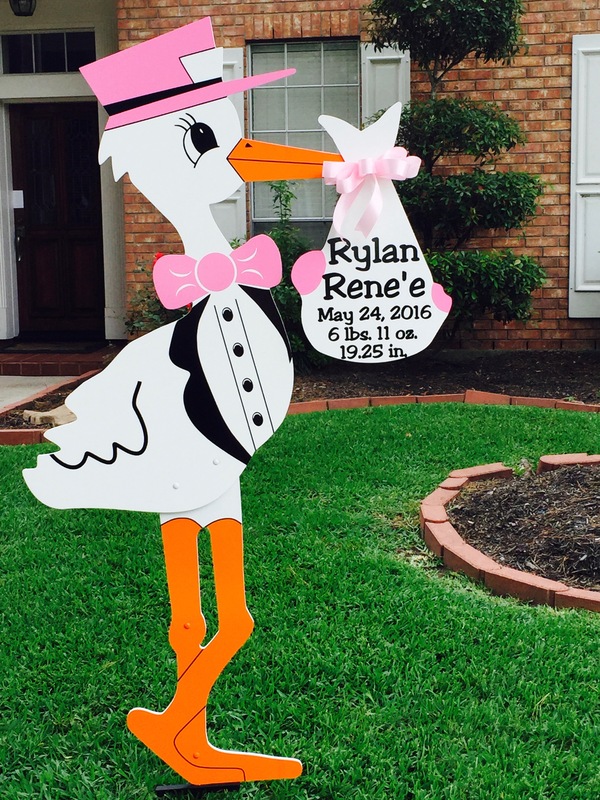 Stork lawn signs are also a great idea to celebrate at a gender reveal party or a baby shower. We even have big brother and big sister sibling signs so big kids can help welcome home the new baby, too! Our 6-foot stork lawn sign is personalized with the new baby’s name, birthday, weight, and length on a keepsake bundle and makes an excellent “Welcome home baby!” announcement. Order right from the hospital after the new baby or grandchild is born! We need AT LEAST 24 hours (and usually 48 hours) to personalize your Stork yard sign and confirm availability. Please visit our Order Page to request a sign. Please note: orders must be placed on our Order page so we can check availability. Please visit our FACEBOOK and Instagram page to see pictures of our most current Stork sign rentals. Sweet Southern Storks is conveniently located in SE Houston and proudly delivers Stork signs for your new baby to Alvin, Clear Lake, Dickinson, Friendswood, Hobby Area, Kemah, League City, Manvel, Pearland, Pasadena, La Porte, Galveston, Seabrook and Texas City. If you don’t see your area listed it doesn’t mean we will not come to you. Please call to confirm your area. An Additional Fee may apply to certain areas.